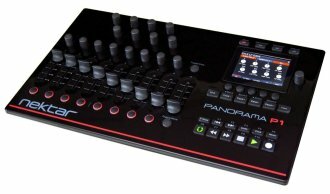 The Nektar Panorama P1 is an incredible controller with the most intuitive workflow you have ever seen. Spectacular, deep Reason, Cubase and Bitwig Studio implementations -- along with vast MIDI programming options -- means you can focus on your music instead of the equipment. Set up your generic MIDI presets for instant recall when you need them or use Panorama P1 with Reason or Cubase for a completely integrated experience. So QWERTY macro's...big deal, right? That's right, its a VERY big deal. Your software has a ton of features and functions that can be activated using QWERTY shortcut commands. Assigning a command to a button so you don't have to be near your computer makes life a lot easier. Assigning a string of up to 8 commands takes it to another level. With this powerful feature you could for example enter edit mode, zoom in and select a tool with just one button press. Or create an instrument or effects track and locate a folder containing your presets so you can select them from Panorama, all with one button press and without looking at your computer. Reason ReWired to Cubase or Nuendo is a great experience with Panorama. Select which DAW you want to control straight from Panorama, in absolute real-time and regardless of what's in focus on your computer. Cubase 6, 6.5 and 7 supported. Earlier versions not tested.